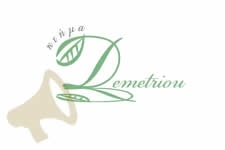 “Ktima Demetriou” was created by Kyriacos Demetriou in 1984 as a communication and relaxation mean with nature. The great love and nostalgia of the owner’s childhood in Cyprus, led to the creation of a unique space, where traditional objects from the beginning of 19th century were gathered and protected from time. The scope of “Ktima Demetriou” is the protection and the restoration of these traditional objects in a magnificent landscape and thus the transmittal of the Cyprus great history, values and heritage to younger people and other nationalities. After all, history and civilization are the nation’s treasures. The museum is consisted by two large rooms. The main room includes items that have been used by different professional disciplines of the 19th century such as carpentry, iron-worker, smith, and shoe manufacture, farmers etc. In addition, visitors will encounter objects of everyday use such as scales, sickles, flame throwers etc. The second room includes treasured objects of the women’s everyday use such as sewing machines, typewriter, traditional iron with charcoal etc. Ktima Demetriou brings together a series of olive oil mills. The visitor will have the chance to learn and admire the evolution of olive oil mills throughout the years (begging with the simple manually operated olive oil mill where the olives were crushed and the oil was gathered manually, and moving to the use of the machine during the industrial revolution) The particular area also includes all the necessary machinery for the proper operation of the olive oil mills such as scales, oil separator, oil washer, storage vessels etc. The visitor will be able to learn the traditional method of wheat and barley milling for the production of different flour types. The production of the different types of flour was usually executed by the village’s miller. Traditional Coffee Shop - TavernThe traditional coffee shop has been built to the true dimensions of the coffee shop of that era. The coffee shop includes few tables with chairs, the wine barrels and the wood stove. The coffee place also includes the old traditional way of making Cypriot coffee by using the brass or copper briki (which was placed in the hot sand to slowly dissolve the coffee beans flavorsome compounds). During the night, the owner’s wife was preparing a few delicacies in the next room- the tavern. The winery concentrates the different methods of wine production throughout Cyprus long history. The area also comprises the method of production of the traditional zivania and rosewater through distillation. The wine cellar includes the different wine, oil and xaloumia storage vessels such as the pitharia and lamitzanes. Ktima Demetriou contains a representative sample of a traditional mansion of the 1940s. 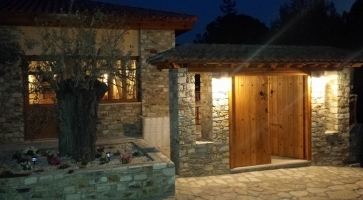 “The Makrinari” is consisted by two main rooms, the bedroom with the traditional beds (karkoles) and furniture, and the living room with the traditional sofa, table and various other items such as old radio, typewriter, mirror, chest etc. *** For a personal guided tour a booking is required through our website! The traditional Cypriot taverna at Ktima Demetriou is decorated in tones backed-out from our tradition. 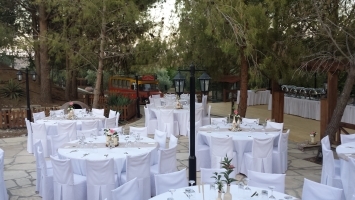 Come and taste our rich and quality dishes, among the majestic pine trees of Stavrovouni. Ktima Demetriou can fully accommodate into its areas (tavern/reception hall, cafe-bar and pool area) large parties and events such as weddings, engagements, christenings, birthdays, business parties, etc. For more information or any questions please contact us! 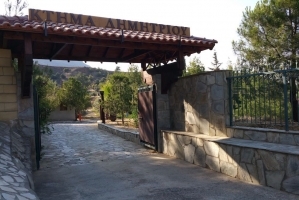 Ktima Demetriou is located to Anglisides, it the road to Stavrovouni. View the path in the map below. Follow the signs on the road. Our coffee shop at Ktima Demetriou will be open for everybody everyday (Tuesday to Sunday) with free entrance. Join us and spend a wonderful day in the nature. Combine your visit with a private tour and shopping of traditional products and gifts from our souvenir shop.